Home > Blog > Gardening > Bugs & Pests > What are Solifuges? Have you ever in your life seen anything so weird as this?? Found this on our outside deck! Had to do some research on this creature – Hannes calls it a haarskeeder! 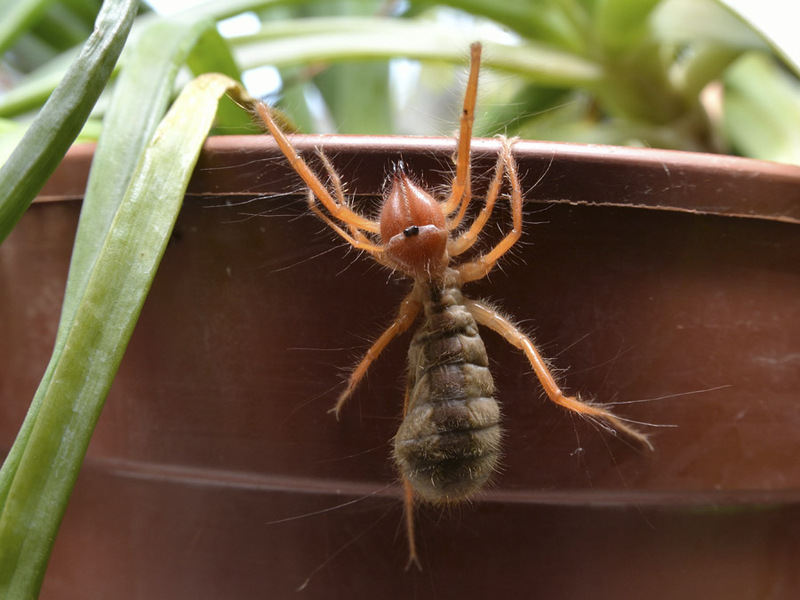 Members of the order Solifugae, usually referred to as solifuges, solifugids, solpugids or by an assortment of vernacular names (e.g., camel spiders, false spiders, haarskeerders, jagspinnekoppe, jerrymanders, roman spiders, sun spiders, walzenspinnen, wind scorpions), are a diverse and fascinating, yet poorly known, order of specialized, mostly nocturnal, cursorial hunting arachnids notable for their massively powerful two-segmented chelicerae, voracious appetite, and tremendous speed (Punzo, 1998). They constitute the sixth most diverse order of arachnids in number of families, genera, and species (Harvey, 2002). Many solifuges are able to run at extremely fast speeds (53 cm/sec) for short bursts, but like most arachnids, cannot sustain such rapid locomotion for long periods. Solifuges vary from a few millimeters to 10 centimeters in length and look superficially like stout, hairy, fast-running spiders with an extra pair of legs (leg-like, sensory pedipalps, held out in front of the body). Sunspiders are not really spiders. They are a very important animal group in Namibia, which has the highest diversity of sunspiders in the world, and many peculiar endemic species. According to current theories, Namibia is also the place from where sunspiders evolved. As part of the research project, three scientists from Germany are in Namibia to collect sunspiders for research. Youy won’t believe – I had one of these INSIDE the house this evening!! Must be the season for them perhaps? I love finding interesting insects and arachnids in the garden, but I think this one would make me jump back a bit! Oh my, what a creature. I’m sure I’ve seen these here too and thought they were some type of big red ant! Hee!! It was the first time that i saw this thing -I thought it was a kind of a scorpion!! Very ugly looking and hairy too! It really is amazing the diversity of creatures you will find in your soil and on or around your plants. Even when you grow seedlings inside during February a lot of the bugs in the house seem to be attracted to the fresh soil. Oh thank you – I will definitely check it out.